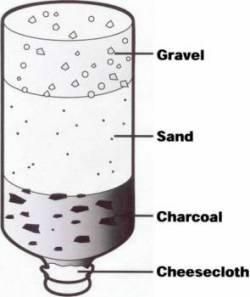 A Using a 2 liter bottle it is east to make this version of simple water filtration – I’ve seen a larger scale design using silk fabric for the final stage (silk being a finer weave than cheesecloth or bandana). **Water filtered like this should still need to be sterilized/purified for human consumption – either by a rolling boil for at least a minute or use water purification tablets. But in a worst case scenario, it is better than drinking it straight from the source. This entry was posted in Year Zero Survival Blog and tagged bacteria, Emergency, filtration, safe water, survival, survival hacks, water by staff-writer. Bookmark the permalink.